Carrie appears to have shut down her Etsy shop. Carrie from the Wallaby Bag Company is a well-traveled New-Englander who makes high-quality hand made cell phone cases and laptop sleeves that would brighten anyone's day. Naturally, we wanted to find out a bit more about her. Please welcome Carrie and enjoy this exclusive interview with her. 1. Hi Carrie, thank you for joining us today. Please take a moment to tell us about your company and anything else you'd like our readers to know about yourself. 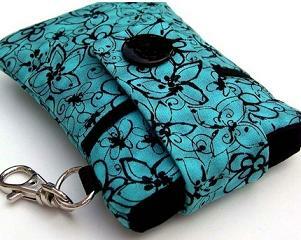 The Wallaby Bag Company creates cell phone and iPod pouches and sleeves, as well as for laptops and the new Apple iPad. All items are handmade by myself and sold on the Etsy website. We began in March of 2009. The name came to me on a trip to Disney's Epcot, my daughter gave me a stuffed Wallaby from the temporary Australia exhibit, which I thought was a squirrel. I thanked my daughter for the cute "squirrel" and I put it in my husbands backpack to take home. During this trip, I was carrying a bag I purchased from a local department store. I hated that bag. It was so cumbersome and the way it was designed made it difficult to get in and out of. I thought about how lucky Wallabies are to have a built in pouch of their own. I decided I would make my own pouch when I got home. Upon our return home, while I was unpacking from our trip, I took the stuffed "squirrel" my daughter gave me out of the backpack and low and behold.....it was a Wallaby! So there you have it, the name pays tribute to the upright two legged mammal with a cute little face and a built in pouch! 2. You talk about loving Australia and about how the idea of the making a pouch came to you during a trip to Disneyland. At the same time many of your creations seem inspired by a certain places. Various pieces evoke enchanted gardens with peacocks, Japanese cherry blossoms, and Caribbean palm trees and coconut shells. Do you try to evoke a sense of place and is travel an important part of your life? I am so happy you picked up on that! I do love to travel and the environment and it’s riches are a big part of my life. I try to name all of my pieces so my customers can refer to them by name rather than “the one with the green background and fuchsia flowers”. Most importantly, I would like my customers to associate my pieces with another place in time, or an escape. I don’t think my customers will feel like they’ve just visited Tuscany every time they pull their phone out of a “Tuscan Vine” pouch, but I would like to think that I reminded them of a trip they once took or may take, even if just for a minute. 3. 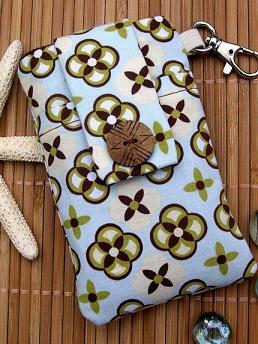 How do you go about choosing the materials for your cell phone pouches? I often look for patterns that are whimsical, dreamy, or as you previously stated, evoke a sense of place. Initially, I purchased patterns that I would like to carry myself. But I learned over time that just because I DON’T like something, doesn’t mean it will not be liked by others. For example, the Orange Blossom and Sparrow fabric was the only fabric in my inventory that I wouldn’t use until one of my customers requested a pouch with the same colors. So I showed her that fabric and she bought two! I made another and listed it in my shop and it has been my biggest seller since. For the interior, I use felt. Felt is often used on the bottom of furniture to protect wood floors and in drawers to prevent silverware from scratching. 4. You mention you try to get your children involved. How do you think it has helped them? My creativity and passion is what is driving my little business. I think it has taught my children that being successful comes in many different shapes and sizes. They also see how important it is to do things the right way. If a pouch doesn’t turn out right the first time, I remake it. If I tell a customer I will have their order in the mail on a certain day, I keep my promise. My customers purchase my pouches with their hard earned money, and it is my responsibility to make sure they get what they paid for. On a side note, they love seeing my pouches travel to far away places like Russia, Tanzania and Australia. 5. Thanks again for this interview. I see that you've just passed the one-year anniversary on Etsy. How would you describe your experience, and what are your plans for the future? My experience has been better than expected. I hoped it would happen this way, but never expected it. My plans for the future are to include laptop bags, messenger bags and shoulder bags and I am currently working on a website external from Etsy. I do want to grow. How much? I’m not sure. Right now I am happy with the steady climb I have made thus far. I have a quote taped to my laptop that reads “whoever wants to reach a distant goal, must take small steps”. 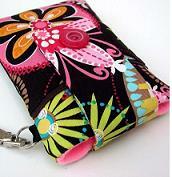 Prepaid Plans › Unique Cell Phone Cases › Wallaby Bag Co.